I visited the Wedding Dresses (1775-2014) exhibition at the V&A last week. It was a fantastic display of bridal fashions ranging from incredibly wide 1700s dresses which would make you turn sideways to get through doorways (I explained that really badly, I mean this kind type of thing), to modern day celebrity wedding dresses. The annoying thing was that you weren’t permitted to take photographs or even sketch the dresses! I have no idea why, and it was all very annoying, so I’m afraid I haven’t been able to take any photos of the wedding dresses featured in the exhibition. I have taken lots more photos though, which hopefully you’ll like just as much, and you can see some of the dresses in my Pinterest gallery below. 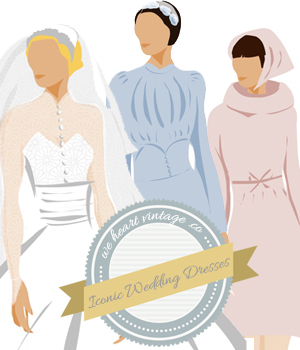 Follow We Heart Vintage’s board V&A Wedding Exhibition on Pinterest. The dresses which really stood out tome were the famous modern dresses. They had the amazing 1930s-inspired Galliano dress Kate Moss wore when she got married, Dita Von Teese’s magnificent purple Vivienne Westwood gown and Gwen Stefani’s ombre pink and white wedding dress by John Galliano in 2002. Why oh why aren’t you allowed to take photos? Or failing that why aren’t you allowed to sketch the dresses? Really, what harm can it do? All the shoes they had on display were really tiny, apart from the Duchess of Cornwall’s (that’s Camilla Parker-Bowles) wedding shoes (designed by L. K. Bennet) which were pretty large – although still miles narrower than my rather fat feet! I’m still not convinced by Gwen Stefani’s ombre pink and white wedding dress (picture here). It looks like stood in a puddle of bring pink ink and it soaked up her skirt. Apparently the pink was spray painted on by Galliano. Also, the veil she wore had really frayed edges, which I wasn’t keen on at all. It looked like a child had cut the veiling with a pair of scissors. Hmmm. Kate Moss’ Galliano wedding dress was just amazing. The sequins and embroidery were exquisite, and I seem to remember the feathers embroidered on the skirt were supposed to be phoenix feathers. Either way it was amazing – definitely the stand-out dress of the exhibition! Dita Von Teese’s ‘Bird of Paradise’ dress was magnificent, but not really like a wedding dress, more like an extravagant 18th century masked ball costume! I loved the cut – Vivienne Westwood is just amazing and I guess a violet gown was perfect for a midnight wedding to Marilyn Manson. Another really stunning gown was that of Barbara ‘Baba’ Beaton (sister of Cecil Beaton) who’s society wedding in 1934 caused a real stir at the time. She wore a high necked figure-hugging gown with a two pointed train which you can see here – it’s so elegant. Ian Stuart’s flower bomb dress was amazing – if Audrey Hepburn had got married in My Fair Lady, she would have worn something like this! Lunch, V&A style. A Gruyere and ham baguette and a cup of Earl Grey – v nice! The central quad of the V&A where I sat to have lunch. Looks like spring has finally arrived! £12 entry but you’re not allowed to take photos. Grrrr…. German door from about 1400. Pine covered with sheet iron. Even the staircases are works of art! I didn’t take down the details of this sculpture of a little girl, but I came across her on my way out – isn’t she delightful? The Flower bomb dress was amazing Helene – so spectacular! I’m frustrated about the book I bought though – it doesn’t actually have all of the dresses in there. It’s a more general book about wedding fashions with just half a dozen of the exhibition dresses in there. Wish I’d saved some money and bought the post-card book of the exhibits instead now! Still tempted to go and see their Alexander McQueen exhibition though, but I’ll wait until the crows have calmed down a little first! I love museums, and these pictures are amazing!